Bitcoin has been one of the most talked about talked topics over the past year. Despite of this there is relatively little economic research that has been done on the topic so far. However, a new working paper by William Luther and Josiah Olson add important insight to the economics of bitcoin. Have a look and let me hear what you think of Will and Josiah’s paper. Will is telling me that he and Josiah have more in the pipeline. I will look forward to that – Will never disappoints writing interesting stuff. 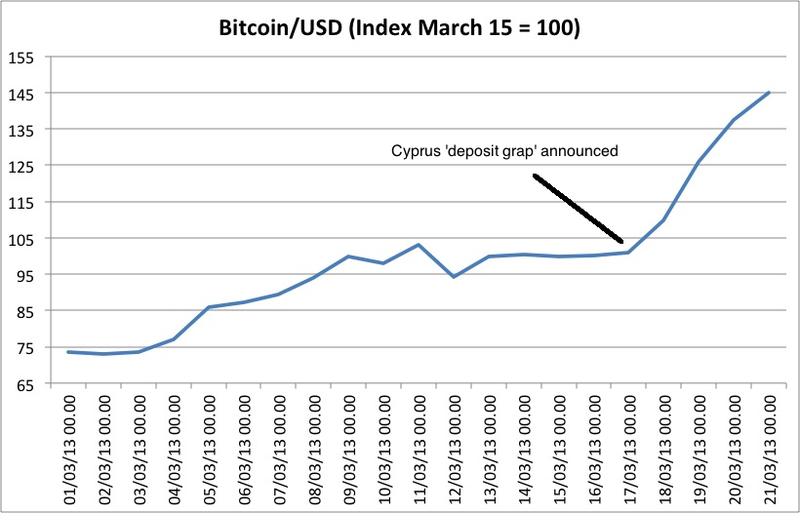 Nowhere is the fears sparked by EU’s ‘deposit grab’ in Cyprus more visible than in the price of Bitcoins. Take a look at this graph. “When Zimbabweans say they are waiting for change, they are usually talking about politics. After all, the country has had the same leader since 1980. But these days, Robson Madzumbara spends a lot of time quite literally waiting around for change. Pocket change, that is. He waits for it at supermarkets, on the bus, at the vegetable stall he runs and just about anywhere he buys or sells anything. For years, Zimbabwe was infamous for the opposite problem: mind-boggling inflation. Trips to the supermarket required ridiculous boxloads of cash. By January 2009, the country was churning out bills worth 100 trillion Zimbabwean dollars, which were soon so worthless they would not buy a loaf of bread. But since Zimbabwe started using the United States dollar as its currency in 2009, it has run into a surprising quandary. Once worth too little, money in Zimbabwe is now worth too much. “For your average Zimbabwean, a dollar is a lot of money,” said Tony Hawkins, an economist at the University of Zimbabwe. This is of course is a very visible monetary disequilibrium – the demand for coins simply is outpacing the supply of coins. As a consequence Zimbabwe is now struggling with a quasi-deflationary problem. Somewhat paradoxically taking recent Zimbabwean monetary history into account. Monetary history is full of this kind of “coin problems” that we now have in Zimbabwe and there are numerous solutions to the problem. In the NYT article one such solution is suggested is that the Zimbabwe government should start minting coins again. However, in Zimbabwe nobody is willing to accept in coins made produced by the government and who can blame them for that? So credit slips, candy, pens and matches are used as coins. Obviously this is not a very good solution. Mostly because the “storage” quality of these quasi-coins is very bad. The quality of candy after all deteriorates rather fast is you walk around with it in your pockets for a couple of days. Among the problems in Zimbabwe is also that there is really not any local “manufacturers” that would be able to issue coins which would be trusted by the wider public and as the general “trust” level in Zimbabwean society is very low it is questionable whether any local “agent” would be able to produce a trustworthy coin. However, a solution might be found in another African country – Kenya. In Kenya the so-called M-pesa has become a widely accepted “coin”. The M-pesa is mobile telephone based payments. Today it is very common that Kenyans use there cell phone to make payments in shops with M-pesa – even with very small amounts. Hence, one can say that this technological development is making “normal” coins irrelevant. You don’t need coins in Kenya. You can basically pay with M-pesa anywhere also in small village shops. M-pesa is Good Money – or rather Good E-Money. Therefore, the Zimbabwean authorities should invite international telecoms operators to introduce telephone based payments in Zimbabwe. The mobile penetration in Zimbabwe is much lower than in Kenya, but nonetheless even in very poor Zimbabwe mobile telephones are fairly widespread. Furthermore, if it could help solve the “coin problem” more Zimbabwean’s would likely invest in mobile phones. Hence, if private telecom operators were allowed to introduce (lets call it) M-Mari (Mari is shona for ‘money’ as Pesa is swahili for money) then the coin problem could easily be solved. In Kenya M-pesa is backed by Kenyan shilling. In Zimbabwe it M-Mari could be backed by US dollars (or something else for that matter). This might all seem like fantasy, but the fact remains that there today are around 500 million cell phones in Africa and there is 1 billion Africans. In the near future most Africans will own their own cell phone. This could lay the foundation for the formation of what would be a continent wide mobile telephone based Free Banking system. In fact why not imagine a situation where Bitcoin merges with M-pesa so you get mobile telephone money backed by a quasi-commodity standard like the Bitcoin? I think most Africans readily would accept that money – at least their experience with government issued money has not exactly been so great. See this new excellent interview with George Selgin. I think it is harder to find any bigger expert on Free Banking theory and Free Banking history than George. Great stuff – even though I do not agree with everything (yes, believe it of not – I do not agree with everything George is saying). George in the interview recommends that the Fed should introduce a NGDP target rule as a second best to his preferred solution to abolish the Fed. George thinks that a NGDP target rule could be introduced as a Bitcoin style computer algorithm – similar to what he suggests in his recent paper on Quasi-Commodity money (in the paper he discuss a Free Baning solution rather than a central bank solution). I personally think that a Quasi-Commodity standard could be the future for Free Banking money, but I think Scott Sumner’s suggestion for a futures based NGDP targeting regime would work better as long as you maintain central banks. Lasse Birk Olesen’s guest post about Bitcoin inspired me to do a bit of Googlenomics. I simply had a look at searches in Google for ‘Bitcoin’ using Google Insight. The “bubble” that Lasse talked about in 2011 is certainly also visible in google searches. Have a look on this graph. Since June 2011 the search activity for Bitcoin, however, has gone down somewhat, but is still at a somewhat higher level than prior to the 2011 spike. So judging from a bit of Googlenomics Bitcoin is still alive – whether it is kicking is another question. I am still not sure what to make of Bitcoin as an alternative currency. However, any monetary theorist should take the development in the Bitcoin market serious as it might tell us something about not only the Bitcoin itself, but also about the general monetary developments. It would for example be very interesting to see a study of what determines the exchange rate for Bitcoins against other currencies. Furthermore, if anybody is aware of any serious academic studies of the Bitcoin market I would be very interesting in hearing from you (lacsen@gmail.com). Everybody interested not only in Bitcoin, but more generally in what George Selgin has termed Quasi-Commodity money should have a look here. Scott Sumner as a somewhat different, but equally relevant in a post today. I will not in anyway promise to give more attention to the Bitcoin phenomon. That is not the is not the purpose of my blog, but I do promise that to the extent that I think the Bitcoin market can teach us more about monetary theory and monetary policy in general I surely will follow up on these developments in the future. Lee Kelly in a recent guest post here on The Market Monetarist discussed the implication of excess demand for money for the development of barter and Free Banking. I found Lee’s discussion extremely interesting and think that it could be interesting to see how monetary disequilibrium actually could work as a catalyst for the development of alternative monetary systems – for example the development of so-called local currencies in Greece. One of the most interesting developments in recently years in the fields of alternative monetary systems is Bitcoin. I am no expect on Bitcoin and I have certainly not made up my mind about the implications of Bitcoin so I have asked the founder of BitcoinNordic.com Lasse Birk Olesen to do a guest post about Bitcoin. I am happy that Lasse has accepted the challenge. Started in 2009, the decentralized means of exchange for the internet known as Bitcoin has been gaining traction every year since. With no central institution backing it, with no one knowing whether to classify it as currency or as commodity, and their inherent nature making them hard to regulate, Bitcoin has been the subject of much controversy. This post is a short summary of what I have learned about Bitcoin and serves as an introduction to the concept, its economic properties, and a couple of its potential implications for the financial infrastructure of the world. How does it work? Consider a special type of e-mail that cannot be copied. This means that when you forward this e-mail to someone else, you must lose it from your own inbox. Now also consider that there exists only a finite amount of these special e-mails, and no one can create more of them. Because of these properties, people have started considering these e-mails as valuable. These unique e-mails are of course called Bitcoins. The above is a technically incorrect description of how Bitcoin works (see The Economist for a more accurate and technical overview). But it is a useful analogy for a quick understanding of the concept, and it is not too far from the actual end-user experience. As Bitcoins have no physical manifestation and no use besides as a medium of exchange, many economists (some citing Mises’ regression theorem) have predicted their value to be a bubble driven by novelty and hype, just waiting for an inevitable burst. And the Bitcoin price definitely did experience a bubble in the summer of 2011. Going from 1 USD/BTC to 30 USD/BTC in just 2 months from April to June and then dropping back to 2 USD/BTC in November, most of the Bitcoin critics would probably have bet that the show was over. But over the next couple of months the exchange rate went back to 5 USD/BTC and has remained in that area since. While the exchange rate is not in itself an indicator of the success of Bitcoin, it is of course an indicator of the market’s expectation of the future success of Bitcoin. If Bitcoin enjoys widespread adoption its exchange rate is bound to rise as demand increases. But while the Bitcoin critics are right that most historical money such as gold had other uses before they became accepted as money, as Mises’ regression theorem states, this does not mean that it is the only way a viable money can come into existence. Historical examples of money with no other uses exist. One is the case of large rocks known as rai stones which were used for trade between the islands of Micronesia. The rocks, definitely too large for use as tools, derived their value solely from being a means of exchange. In other words, the only reason to value them was because everyone else did. In addition, Bitcoin is the first electronic cash system being completely decentralized and semi-anonymous. No one needs to know who you pay or how many you own. Adding these properties together gives you a unique money system that the world has not seen before. It streamlines many financial operations, and it can open up entirely new markets that had been impossible until now. This uniqueness is what drives the support of the Bitcoin community and gives each coin value. No other system currently allows you to transfer value to the other side of the world in seconds practically for free and without identifying yourself. 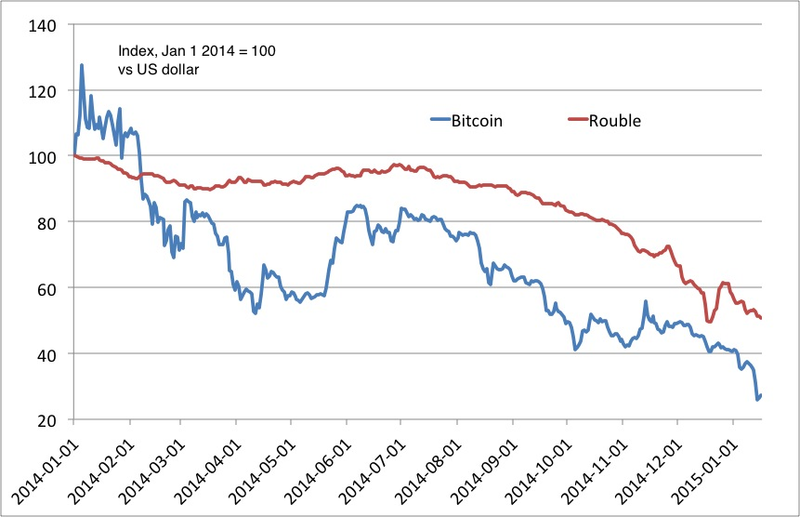 As a store of value, however, Bitcoins are still a very poor money, as the mentions of the exchange rate above shows. But with the existence of liquid exchanges to traditional currencies in multiple countries it retains its use as an international transfer of value. And if Bitcoin sees widespread adoption the exchange rate will become less volatile as market depth increases. The inherently decentralized and semi-anonymous nature of Bitcoin makes it hard to regulate. You cannot punish a violator of your country’s laws if you do not know who he is. And you cannot shut down a system if it doesn’t have a point of attack. Trying to close decentralized networks such as Bitcoin is like cutting off Hydra’s heads: Cut one and two new ones grow as the entertainment industry has already realized in combating file sharing networks. This means that Bitcoin will potentially enable free banking in Bitcoins even if government regulation doesn’t allow it as banks can keep accounts and transactions hidden. At the moment, there is little to no banking activity in the Bitcoin economy. Lending is done on a peer-to-peer basis between forum users across the world. Because of the difficulty in assigning credit ratings to internet nicknames, interest rates are naturally high in this very interesting and unregulated developing market. If Bitcoin adoption grows, we should expect actual banks, with or without government banking licenses, to appear to judge borrowers based on face to face interactions instead of internet forum posts. A common misconception is that fractional reserve banking is impossible with Bitcoins. But just as fractional reserve banking can be done with gold it can be done with Bitcoins. In addition to new opportunities for free banking, I predict that given a larger adoption of Bitcoin we will also see less private banking. The main reason most people store fiat money in banks is not to get interest on their small amount of savings. They do it to for security and to be able to participate in the electronic economy – that is, to be able to shop online and avoid the need to carry around cash and use credit cards instead. Bitcoins are incredibly flexible when it comes to storage. They can be stored on any digital or analog medium, encrypted by cryptography stronger than used in online banking, and backed up to an infinite amount of locations. They can even be saved in your brain. If your assets are in Bitcoin you no longer need a bank for safeguarding. And as they are inherently digital, you don’t need a bank to act as a gateway for you to spend them in the electronic economy. Stored on your smartphone you could carry them to a restaurant and pay the bill using your phone instead of a card. People having less reasons to store their money in banks will contribute to a higher real interest rate. On the other hand, the deflationary nature of Bitcoin will encourage savings and contribute to a lower interest rate. I cannot predict which will be the dominating effect (note: corrected slightly compared to earlier version). An interesting development is the creation of Bitcoin-enforced contracts. For an example of how this could work consider you bought a car for a small down payment and has agreed to make more payments once a month. With the car being connected to the Bitcoin network, it could check for new payments to the seller’s Bitcoin address every month. If your monthly payment has not arrived the car will refuse to start. One could also imagine this happening today with a deactivation system remote controlled by the car seller. But what if the seller deactivated your car after you had already made all your payments? With a Bitcoin-enforced contract you don’t need to trust the seller, you only need to trust the Bitcoin network of which everyone can check the source code. Also, scripts can be embedded into Bitcoin transactions which opens up for even more contractual possibilities. One use of this is for pooling resources towards a common good, i.e. to fund the creation of something with positive externalities. Say your neighborhood wants to buy an empty lot to turn it into a park. Normally someone will start raising money, but what happens if he doesn’t get enough to actually complete the project? Can you trust him to give you your money back? Instead, you can make your donation to his Bitcoin address with the condition that the money is returned to you if not X amount has been sent by others to the same address before Y date. The Bitcoin network will enforce this without you needing to trust the person accepting the donation or even a third party. As seen in the above section on contracts, Bitcoin is more than a better means of exchange. People discover new uses for the technology every month. One can conceive of several threats to Bitcoin’s survival and widespread adoption: Could a flaw in the design be discovered that leaves the system open to counterfeiting? It’s very unlikely since it hasn’t been discovered yet even as there is a large financial incentive to do so. And if it happens, the system allows for large structural repairs while carrying on using the same coins. Will the world find no utility in larger adoption of Bitcoin? Unlikely as the financial infrastructure of today belongs to the pre-internet era. For instance, it shouldn’t take days and cost tens of dollars to move value from Europe to the US or Asia. Perhaps the biggest threat would be from a technically superior Bitcoin 2 that could replace the current system and leave original Bitcoins worthless. As Bitcoin has the momentum, Bitcoin 2 would need to be vastly improved. And as with anything new, the change will not happen in the blink of an eye. Some will be risk takers and make early investments in Bitcoin 2 while others will stick with the good ol’ familiar Bitcoin for a longer time. I remain optimistic on behalf of Bitcoin. And it certainly is an incredibly exciting experiment that no matter the outcome will have an impact on the theory of money. M-pesa – Free Banking in Africa?